Mold treatment or mold removal: which is right for your home? The specialists at Mold Solutions by Cowleys treating mold on a garage ceiling. For effective mold removal, use certified, experienced professionals that can treat mold safely and completely. Finding the right mold removal option can be a challenge for New Jersey homeowners. A permanent solution is essential, but most homeowners would like to avoid a significant tear-out and reconstruction process. Luckily, Mold Solutions by Cowleys is here to help. Our use of the unique, non-invasive Mold Abatement Polymer Solutions (MAPS) system provides a complete remediation of all mold issues while keeping as much of your walls, floors, and ceilings intact as possible. If you're interested in learning more about how we can solve your mold problems in Central NJ, call us today or click below for a free estimate! Mold growth in a home is a symptom of an underlying water or moisture problem. Mold can rear its head anywhere and everywhere. Like all living organisms, mold needs air, organic material as a food source, the right temperature, and water or moisture in order to grow. We often think of water and moisture problems as external problems where water intrudes into the home from the outside, such as from flooding or a cracked foundation allowing water seepage from water-saturated soil. But oftentimes, the problems are internal. There are building or repair issues responsible for water accumulation. Common problems are burst or leaky pipes, non-operational sump pumps, backed-up gutters, and a variety of condensation problems from poor building design. Condensation easily forms on cold metal pipes and cold concrete floors as well as from our everyday activities that release moisture including cooking, washing clothes, and bathing. It is no surprise that often mold grows and thrives in crawl spaces, basements, attics, kitchens, washer/dryer areas, and bathrooms. One of the most important ways of reducing condensation in our living spaces, is through proper ventilation. A well-ventilated home is essential for removing moisture, especially in our bathrooms and kitchens where large quantities of steam permeate the air from hot water. Homes often have vent fans installed in bathrooms to carry away moist air. Proper building construction dictates that vent fans, whether bathroom vents or dryer vents, be vented directly outdoors. Venting exhaust fans into the attic is asking for trouble, even if the attic itself is vented. The excess moisture can cause condensation on the rafters and sheathing, which can lead to wood rot, moisture-saturated insulation, and dangerous mold growth. This homeowner in Kendall Park learned this lesson the hard way. The installer had vented the bathroom fan into the attic rather than outside, and, sure enough, he found himself with a serious mold problem overhead. For the long-term, the homeowner should fix the venting problem to remove the underlying condition allowing mold growth. However, Mold Solutions by Cowleys resolved the immediate problem. In less than a day, we applied a powerful anti-microbial to kill the mold, and then applied a patented, proprietary sealant containing silver micro-particles. Cowleys is an authorized applicator of this unique sealant; you can’t get it just anywhere. This sealant kills the mold at the cellular level rendering it inert and harmless so it no longer poses a health risk. However, this sealant does much more. It reactivates with moisture to prevent any regrowth of mold, so it not only kill’s today’s mold growth, but tomorrow’s as well. With this project, there was no removal of building materials, no need for home renovation, and no need for the family to relocate. While the homeowner was disappointed that the vent had to be properly reinstalled, he was pleased with Cowleys for taking care of the mold problem so quickly. This project was one of our many successful mold treatment projects — we removed the threat of mold while saving the homeowner the expense and inconvenience of a major renovation that often follows the tear-out of building materials by traditional mold remediators. A Mold Solutions by Cowleys team was dispatched to an office building in Toms River to treat a serious mold problem in the basement. Although mold growth can happen anywhere in homes and commercial buildings, basements and crawl spaces are common trouble spots because these particular areas often have higher levels of moisture and humidity than the living spaces above. According to the owner, he has been dealing with mold issues in the basement for years. Periodically, he tried “DIY” mold remediation, including purchasing different over-the-counter mold removal sprays and saturating the mold with bleach. Not surprisingly, none of these methods worked. Every time, mold returned. The building owner commented that the only thing he successfully removed was money out of his pocket. 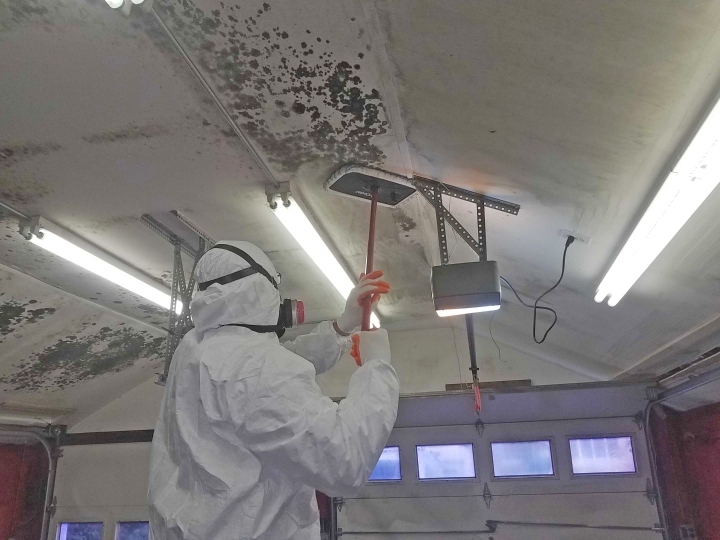 Finally, he decided it was time to definitively treat his chronic mold problem, and after researching a number of companies and their mold removal process, decided to go with Mold Solutions by Cowleys. First, the Mold Solutions team treated the basement with our EPA-registered anti-microbial (MAPS 1) that kills surface mold and airborne mold spores. Next, we applied our patented polymer sealant (MAPS 2). This unique sealant is available only to select pest control operators licensed to apply chemical products inside buildings. While completely safe and non-toxic, this sealant completely destroys mold. Upon contact with the sealant, any mold is rendered inert, harmless, and non-allergenic. The sealant’s unique feature is its moisture-sensitivity. It will reactivate to prevent the return of any new mold growth in the treated areas, killing both today’s mold and any future mold growth. There is no other mold application on the market with this mold-destroying capability. This homeowner in Lakewood, NJ, had some paintings and pictures that were hung along the walls of the staircase leading into the basement. He had taken them down in order to clean them, and when doing so, had an unpleasant surprise — there was mold hiding behind them. Paintings and pictures that are flush against walls can sometimes develop mold if the walls are damp in any way. Air circulation helps to minimize mold growth. When hanging paintings or pictures, it is recommended to have a spacer so they are not in direct contact with the wall. With this home, the staircase area had the perfect environment for mold growth because humid unconditioned air from the basement came into contact with conditioned air from the first floor. You could feel the dampness in the walls from the condensation. We treated the mold in the staircase with an EPA-registered antimicrobial (MAPS 1) followed by a patented sealant that encases the mold and kills it on contact. This sealant has the unique property of reactivating if exposed to moisture, killing any future mold growth in the treated areas. We also wiped down any visible mold growth as we proceeded. The homeowner did not want to risk future mold growth in the staircase area or basement of his home. The only long-term solution is to keep down the relative indoor humidity level in the basement (below 55%), so mold cannot grow. We installed a commercial-grade high-performance SaniDry Sedona dehumidifier and filtration system that is specifically designed to work in basements and crawl spaces. These dehumidifiers operate automatically with a built-in humidity sensor (humidistat) that allows the homeowner to set the target humidity level and let the machine take care of everything else. Also, these humidifiers drain directly either outdoors or to a sump pump, so there is no pan or reservoir to empty. The utility room of a unit in a Lakewood, NJ apartment building was located outside, off the balcony. Unfortunately, the apartment unit above theirs, with a virtually identical layout, had a water leak in their utility room. The pipe leak in the unit above was fixed, but the damage to the unit below was not corrected in time. Water had seeped down into the ceiling tile and sheetrock of the utility room. This mishap took place during the summer, and the residents of the bottom unit were unaware of the water issue above the,. These utility rooms were not air-conditioned. Also, these rooms were outside by the balcony and filled with hot, humid outdoor air. Unfortunately, the conditions were perfect for this small enclosed space to turn into a “petri dish” for mold growth. Although the sheet rock had superficial mold growth, it had not lost its structural integrity. The only problem with the material was the mold itself. A mold remediation company had examined the utility room prior to us, and informed the apartment manager that the sheetrock would need to be torn out and carted away. Fortunately, Mold Solutions was contacted for a second opinion. We explained that, with our treatment process, we are often able to treat the mold right where it sits, making it unnecessary to remove the underlying building materials on which the mold is growing provided that the materials are not damaged and structurally sound. In fact, treating the mold directly is far more effective because removal of building materials disrupts the mold spores. These airborne microscopic particles simply reattach elsewhere and mold growth soon reappears. A two-man crew treated the utility room mold by applying an EPA-registered antimicrobial (MAPS 1) followed by a patented sealant (MAPS 2) that encapsulates the mold and kills it at the cellular level. Also, the sealant is moisture-sensitive and reactivates to kill any future mold growth. In less than a day, we successfully treated the mold and avoided an expensive and unnecessary tear-out and renovation project. Finally, although we thoroughly wiped down the mold stains, some of the stains were too deeply embedded to remove completely. Mold stains are the residue of the mold enzymes dissolving the materials (mold is nature’s decomposer). Although mold stains look horrible, they are not harmful or allergenic like the mold itself. Even though the utility room is not a “living space” of the unit, if these residents don’t want to be reminded of the mold growth when visiting the utility room, the solution is easy. With a fresh coat of paint to the utility room walls and ceiling, you would never know that there was once was a mold problem. Recently, a two-man crew from Cowleys Mold Solutions was sent to a home in Lakewood, NJ to resolve a basement mold problem resulting from chronically high indoor humidity levels. Mold can form simply from high levels of moisture in the air not just from a water issue. When furnishings are sitting on damp floors or placed flush against damp walls, mold will often start to form. So, for example, when hanging pictures or paintings, we recommend using spacers so the back of the framing is not in direct contact with the wall. Keeping air circulating is important to minimize mold growth, and it important to have good room ventilation. Weather-permitting, air out rooms by opening up your windows to let in fresh air. Also, make sure all of your fans are operational, especially in bathrooms, attics, and laundry rooms. In basements where indoor humidity levels trigger mold growth, the only long-term solution is whole-house dehumidification. By keeping down relative humidity levels below 55% mold cannot take hold. Here, during our inspection of the basement, we found mold growing on a leather couch. Mold can grow anywhere, not just on walls, floors, and ceilings! As seen in the pictures, this mold had a white, powdery appearance, almost like chalk. Different strains of mold have different colors and textures, but no matter its presentation, all mold is potentially harmful. We first noticed significant mold growth on the couch along the base underneath the seating, and after tipping up the couch to inspect its underside, the couch was found to have extensive mold growth. Mold can form on any organic material, including leather. We treated the entire basement with an EPA-registered antimicrobial (MAPS 1) followed by a patented proprietary sealant (MAPS 2) that encapsulates the mold and kills it on contact. The sealant not only kills the existing mold. It is moisture-sensitive and will reactivate to kill any new mold growth. A three-man crew from the Cowleys Home Improvement team was sent to a home in Toms River, NJ. As often happens in homes situated in areas with high water tables, especially after periods of heavy rain or snowmelt, this home had a significant problem with groundwater seepage. As this homeowner found out, an unfortunate byproduct of groundwater entering a crawl space is mold growth. The homeowner realized there was a mold problem down below because that tell-tale earthy, musty smell of mold had permeated the home’s living space. To resolve this problem, we removed the existing fiberglass insulation. This type of insulation in the crawl space absorbs water and is a source for mold growth. Over time, fiberglass insulation in crawl spaces tends to fall as it becomes weighted down and mice just love this material for nesting. These types of insulation are are not specifically designed for the moisture and humidity found in crawl spaces and often wind up causing problems. To treat the mold, we applied an antimicrobial (MAPS 1) followed by a patented sealant (MAPS 2) that not only kills the existing mold, but also has moisture-sensitivity. This sealant has the ability to reactivate and kill future mold growth in the treated areas. To effectively deal with future groundwater intrusions we installed two workhorse “smart pumps” that tie into a discharge line. Homeowners in Toms River, NJ, found that groundwater had entered the basement. Fortunately, it wasn’t a great amount and the cleaned it up and fixed the crack where water was entering. Unfortunately, as this homeowner found out, it doesn’t take much water to trigger mold growth. A couple of days later, they checked the basement and noticed some mold growth on the sheetrock. Mold will attach to any organic material and use it as food, dissolving it with powerful enzymes. Even though sheetrock is made of inorganic gypsum, it has thick sheets of paper that mold will attach to. Here, the sheetrock was not structurally damaged and we could treat the mold directly. As often happens, as long as there is no loss of structural integrity to the materials, we can treat the mold — often in less than a day — and leave the materials alone, avoiding an expensive tear-out and renovation project. Here, we first treated the mold with an EPA-registered antimicrobial (MAPS 1) followed by a patented sealant (MAPS 2) that encapsulates and kills the mold at the cellular level. Finally, we wiped down any visible mold stains. The staining is a byproduct of the mold’s enzymes. The stains are not allergic or harmful as the mold itself. However, it is aesthetically unappealing. As long as the stains are not too deep we can usually clean it off with a mold stain remover. However, sometimes, for deep mold stains, it is necessary to re-paint. The homeowner was pleased that we could quickly resolve the mold issue. With the groundwater problem fixed, this homeowner should not have a return of mold. One of the Mold Solutions By Cowleys crews was called out to treat and remove mold that had formed in the basement of a restaurant in New Brunswick. The basement had significant mold growth on the joists (the lumber supporting the basement ceiling) and the walls due to moisture and condensation from high humidity levels down below. We first treated the joists and walls were treated with our EPA-registered anti-microbial (MAPS 1) to kill the surface mold and eliminate dangerous airborne mold spores. During this process, we were able to scrub away most of the visible mold growth. Next, we applied our patented polymer sealant (MAPS 2). This sealant is safe and non-toxic sealant to people, but deadly to mold. It contains small particles silver that destroys mold at the cellular level, rendering it inert, harmless, and non-allergenic. This sealant has the unique ability to reactivate and prevent the return of any new mold growth in the treated areas, so it not kills both the existing mold growth as well as any future mold growth as well. No other mold treatment product has this capability. Mold formation in this New Brunswick basement could have been prevented if a dehumidifier had been installed. Dehumidification is, by far, the most important long-term preventative measure for controlling dangerous crawl space and basement moisture that will inevitably lead to mold growth. We recommended the purchase of a commercial-grade dehumidifier to maintain indoor humidity at levels that would minimize or prevent mold growth. Mold Solutions By Cowleys sells and services powerful, maintenance-free dehumidifiers specifically designed for basements and crawl spaces. The owner understood the importance of dehumidification to keep a basement clean and dry, and stated that he would contact us at a later date if he decided to go forward with purchasing a unit. Our complete guide to mold prevention and treatment will help you further understand the best options for your home. Click below to read more! Mold grows quickly: Mold needs only moisture, temperatures above 50 °F, and organic material to survive. Mold can grow in 24-48 hours, preferring areas with no sunlight, limited airflow, and little disruption. Mold is not always visible: Mold can grow in concealed areas of your home such as: fiberglass insulation, on top of ceiling tiles, inside ducts, behind drywall panels, in wall cavities, and behind wallpaper. Bleach & detergent will not eliminate mold: Bleach and detergent are limited to for removing mold on nonporous surfaces, and most building materials like wood and all wood products are porous. Mold cleaning is hazardous: Mold isn't a do-it-yourself project. It requires knowledge and protective equipment. Some molds contain mycotoxins that are carcinogenic or deadly. It's easy to accidentally knock hundreds of thousands of spores loose from a single patch of mold! Knowing the best method of solving your home's mold problems can be difficult. At Mold Solutions by Cowleys, we will work with you to ensure that you completely understand our process and the ways that it will help keep your home clean and safe. Don't take any chances with the mold in your home. Call us today to get a free estimate on our mold remediation services and learn how to make mold problems go away and be a thing of the past. We proudly serve in Cherry Hill, Woodbridge, Toms River, Bridgewater, Princeton Junction, Middletown, Old Bridge, Piscataway, New Brunswick, Lakewood and throughout the surrounding areas.